UPDATE, JUNE 23: Way to go, DogTime readers and Save a Dog users! Samoa Joe’s medical treatment is now paid for. HUGE thank you to all who donated — hooray! Samoa Joe arrived at the Espanola Valley Humane Society, little more than skin and bones. Not emaciated, but at 83 pounds, you’d expect to find a bit more dog. The bulk of the weight seems to be concentrated in his giant skull. Joe was picked up as a stray last week, and on Tuesday, we spent a long stretch together. He moves slowly, and has the hard-living look you see on animals who haven’t had the easiest life. He’s four years old, but his demeanor and appearance is that of an elderly dog. Turns out Samoa Joe is heartworm positive. That kind of diagnosis is not always promising for an adult male with Bully breeding in his make-up. 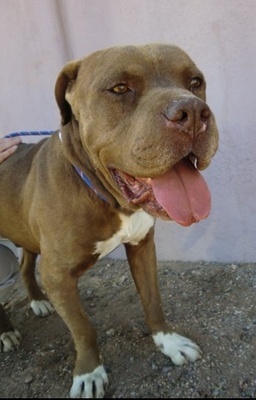 But Espanola is working with Babes & Bullies and Pet-a-Bulls Rescue to find Joe a foster home. Now the shelter just needs help to cover the cost of his $200 heartworm treatment. When I left Joe’s kennel Tuesday, his huge head sank into his paws. I looked into his eyes and smiled but the gentle giant didn’t smile back. His expression in the photo I received today is so different. A sign of hope, I think. Perhaps another Bully ambassador in the making. Grin from Pit Bull mix, Samoa Joe. Make sure to note “Samoa Joe” on your check or in the “In honor of” field in the link.